My garden coming to bloom! Friday it still was great weather so we went to take a look at the fair very nearby. You always find the same stuff on these fair, but it was nice to be outside and have a walk in the sun. I even found some poppy plants, in different colors, yellow, white and orange, I also made a pic of them but it's not the best shot I made. Still I'll show it to you so you see about which poppies I am talking about. There are lots more buds ready to open themselves, so it should be a fantastic view in a few days. Here some white Lobelia I have in a few pots, just gorgeous and some blue flowers I think are called Ceanotis, of a wonderful almost blue colour. I have made more shots, but I will save them for tomorrow. Sadly enough the weekend had a different kind of weather, although Saturday I still had a bit of time in the sun, but towards the end of the afternoon it bacem darker and colder. Yesterday was all strange weather. Morning still tiny bit of sun, but around 3 o'clock afternoon it was real dark, we even had to light a lamp. And then rain poured out of some clouds and even there was some thunder ! But........it was good for the garden, it has been so dry lately! The next few days it will be a bit cloudy, some rain may fall but if they are right towards the end of the week we will have real nice temperatures and lots of sun again. Whoopee! My friend Minky has been busy lately!! She is going through a bit of tough time lately, I hope it will butbe going better soon, but she has found a wonderful way of putting her mind to other things and by what? She started ANOTHER blog, yeah!!! It looks all wonderful and really is worth a visit, so after reading this post hop over to the http://faerienufangelblessings.blogspot.com/. This girl has a never-ending energy and imagination and sharing ability, unbelievable! I am afraid the new blog is so beautiful, that I am almost bound to design something for that too, although she can do easily without my help LOL!But I just love makig cards and sometimes little kits for her blogs, sorry! What about the Magickal Scraps site? The forum is up and running again, only the shop part is still under construction. But I am "hosting" now the daily downloads this week and today will be the last for the May downloads. All links are still up, so you can get the whole kit together if you missed some. And tomorrow we start the June downloads, theme and volour scheme by Snowy, called "My Summer Garden"and ladies, believe me, it's again a wonderful kit!!!! You can take a peek at the top of my blog, where I already posted the slideshow for it, so you'll have an idea what it looks like! Why not quickly inscribe for free into the forum and getting some great daily downloads??? The team has done a lovely job again! Okidoki, enough rambling done again, hahahaha! 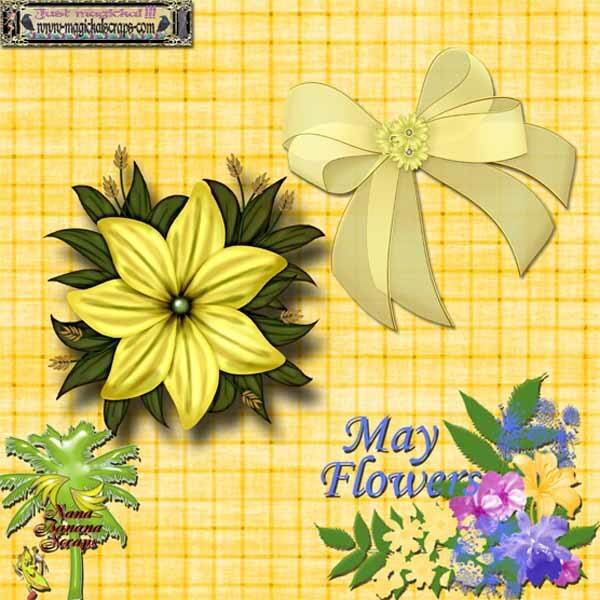 Time to post your freebie, this time again a set of quickpages, named it "Flowers for a Lady". Hope you have some great pictures on your computer that will look stunning in the quickpages. Have fun with them. And also have a wonderful day! Till tomorrow again. Just popping in and out! Indeed a goodmorning, cause it's not yet 08.00 o'clock! Why I am so early? Just because I have to visit my specialist at the hospital for my epilpesie, nothing scaring, just the yearly control and she has to give me my new recipees for the next year. But the appointment is at 09.30, so I have to be quick a bit. It always cuts into the day, such things, time spent there is about 5 minutes, but it takes an hour or sometimes more, to get there, wait, wait, get the medicin and get back home again. I am lucky, the hospital isn;t far away from our home! It seems it could be a rather nice day today, if we speak about the wether. Not too warm, but still sun could pop out a bit later, and if so, Jan and I may go check the fair that is nearby our house this time. You always find about the same stufff as on the other fairs, but.... it gets you out of the house, it can be nice and sometimes you even run into something you still need and suddenly find there. Yesterday we went for a short visit to the second hand store, to look if there were 2 chairs for the garden, but the kind you can put in different positions and may be a little table too. Well, as it is with this store, this time we weren't lucky to find something to our liking, so we will try perhaps next week or so. No big deal. Of course we could buy ourselves new ones, but why spend more money if not necessary? Oh, just came from Ednas blog http://missednasplace.blogspot.com and you should go there too to congratulate Moo, her brother who quit smoking for 200 days now!! Fantastic. I am not yet there, cause it still is hard for me to quit completely. I am working towards it, but I now, I am lacking some willpower for it, although I know it is better for me not to smoke anymore. It's just the question of saying to yourself : from now on it is over with the ciggies. Yeah, I know, but execution is still difficult. But there comes a day I will do just that and stick to it. And it must be in near future too! Okay, I was honest with you, perhaps that is a first step LOL! Now I must get on moving, just have time for another cup of coffee and then off I am. Today there is another kit for you, a small one but made it in PSE8, YEAH!!!!!!!!!!! Each day I am discovering things in the program, so in about a year or 3 to 5 I may be a bit used to it, hahahaha! Yesterday afternoon I though it would be nice to go to the market. The weather wasn't really nice, I think temperature dropped about 10 degrees to the day before, but it was dry, so why not be brave and walk to the market. So I did, I behaved myself, LOL, which means I didn;t buy all kind of stuff, but only things I wanted to. 5 kg of potatoes, a box of strawberries, some fresh herbs(which I cut and then put into the freezer) yummie old cheese and at the butcher just close to the market some meat to make a nice stew( meat there is good and for a nicer price). I looked around of course on the market if there was anything nice for clothing or such, but although I saw some nice things I just looked but didn't buy anything. Today Jan has planned something to do, but to be honest I am not sure what is was. Hope it is;t taking too much time, because I really need to do a bit in the house again. What about the title of the blogpost. that nature is weeping?? Well, for starters there is still the oil leak in front of the coast of America, which is an real aweful thing. Company BP seems to try a lot to close the leak, but aren;t very succesful till now. And you know what is sad? There is a company here in The Netherlands, that has a solution for that, and they offered, it seems, their help(of course for a certain price, but business is business) and I believe the leak could have been sealed already about two weeks ago. All that oil released into the sea is a disaster, and when it reaches the coast areas it will be worse. Then I just read the blog of Minky,http://thecontinentofsulina.blogspot.com/, where I read that there is a big problem at the coast area of South Africa too, because all 20 rivers leading to the sea(direction Cape Town) are poisened with all kind of bacteria, and very bad for humans. Go to her blog to read more about it, but it is a shame that this happened and also very dangereous! And these things are only two of the many more taking place at the moment. I think I am right to say, that Mother Nature is weeping, because too many people are not taking care of it as they should. And lots of these disaters happen, because some people do want to gain heaps of money in short time at any way they can, without considering the effects of their behaving. In a way we all are also bit to blame, because we use the products coming from those companies, but on the other hand we are almost obliged to, because there are little alternatives, and if there are, prices for that are kept too high, so not always possible for everybody to buy that. But just take solar energy! It could be such a great thing, but for a while there were some gouvernment-aided projects for it in Holland, but not anymore or to little, so for a lot of people it is impossible to put e.g. solar screens on their roofs. But in Germany I just saw, projects are very succelsfull, also with gouvernamental aid at first, but it created jobs, soon large areas will be self supportive for energy, and the costs will be gaines back after a few years. Solar energy is clean, you don;t need the oil, but oh my, that cannot happen, there is too much going on in the oil business, what if suddenly the whole world would use solar and wind energy, stick only to that for a moment! What effect it would have on the big oil producing countries and companies? the revenues are enormous, we are talking here about billions of dollars! But one day all wells are dry, and used up and then? Wouldn;t it be much more clever to find other ways to provide energy when there is still time? I think so, but the "big boys"controlling it all are thinking far different, I have the impression. Wow, it doesn;t happen often I am throwing myself into a comment like I did. And I am not explaining it all just as I liked to, but that is because English isn;t my native language ad I am sometimes missing some expressions etc. But I think you understand what I mean to say. Okay, let's jump to a more light hearted subject, the freebie LOL!It's named "Bear-able Life". http://grannycharacters.blogspot.com, for the characters I used. Hmmm, after all this typing I think I deserve my second cup of coffee! So have fun with the quickpages and enjoy your day! Is soccer fever coming up? I am a bit later, but I liked to take it real easy this morning. No big plans for today, so why not ? Yesterday we had an extra gift from the weather! Although predicted much less good than the weekend, it was a radient day with still very nice temperature so I took some sunrayes in the afternoon, in the garden with Mrs. Polifax again LOL. Walking in the different neighbourhoods you notice that soon the World Championship Soccer is starting! In lots of pubs the orange decorations are on again(the colour for our national team and lots of other sport events is always orange) and even in some streets they did their best. Now I only hope that our team will survive the first round, otherwise it will be very sad for all the trouble people take. Obvious we are supporting our national soccer team, but we also pick out an underdog. But we'll have to wait till it all starts, before we can decide which team we are going to support extra. For lots of you this isn;t a very big event, but as you know here in Holland and Europe soccer is a very popular sport! Still have to wait a bit, it all starts on the 11th of June. Anyway, hope you can use this kit. I spent a lovely day yesterday with doing almost mothing LOL! Jan went out in the afternoon, but I just stayed home, did a few tiny little things and then installed myself for a while in the garden with a book of Dorothy Gilman "Mrs. Polifax and the Golden Triangle"! I love those books, specially the humour in it. It was nice and warm in the sun and after reading for about an hour I got very sleepy! So I installed myself on the couch and took a nap. Wonderful. In the meantime Jan came home again and then he took a short nap too. So that's about all there is to tell about yesterday! BOARING BUT OH SO NICE SOMETIMES! In the weekend I received also a few mails from oh so nice people who are having a bit of rough time you could say. It seems that dark clouds of worry and misunderstanding are spreading over people that don;t deserve it at all. Everybody has times of worry and so, but often these bad times are brought to you by other people, because they really intend to do wrong to you and sometimes in their innocence too. The first group is the worse one of course, but I believe life is already difficult enough at times on itself and I cannot understand why people like to make your life more difficult, out of misunderstanding, or greed, or whatever the cause is, it's never a good excuse. So I hope that those dark clouds will go away very soon, and hopefully they will stay away. Let everybody live their life as they choose, in their own way, try to have a bit of tolerance for one another, it may help to have your own life on a happier trail too. Hmm, today is the last day of the Fantasy quickpages, hope you liked them a bit, I promise tomorrow I will have a little kit for you again, with some papers, elements like ribbon, bow and such. And now I will try to make a start for a new kit and then get moving and do the things I have to( you know, the shopping and house, after our looooong free weekend LOL)! Have a wonderful and uncloudy day! After we did a loooong walk on Friday, we went to a fair and then walked back home with a big detour, all together we were walking for about 3,5 hours! It was beautiful weather, great to be outside. I even found a new wallet on the fair, I wanted one with a little chain and clip on it and not too big. The old one I have is almost at the end, LOL, and finally I did find another. They are great to put in a pocket of your trousers and clip the chain to the part where you put your belt through( no idea how to call that) You don;t need a handbag and the wallet is safe for pickpockets. But at the end of the walk I was glad to be home! We gave ourselves a lazy day on Saturday, also because their was a mist hanging over this coast region, which made it unpleasant and rather coldish. But oh wonder of nature, yesterday sun was back and it looked great, so we dicided to go to Scheveningen, to the sea. There should be an exposition of sand sculptures on the boulevard, it could be nice to see. With that in mind we left at about 1.30 in the afternoon and walked all the way to Scheveningen( about an hour) . It was an magnificent walk, we passed through my old neighbourhood which brought back some nice memories. We arrived at the seahore and looked at a few sandsculptures, but that was a bit disappointing. Some were already a bit damaged and you couldn't take a good picture of them, because they were protected by gates. Pity, but we took the stroll along the boulevard, it was such nice weather and I made even a few pics. Then we run in too Jan's sister with her daughter(we almost never see her, but between thousands of people we run into her, can you believe that? ), so we talked for a couple of minutes and the daughter made a picture of us. (we seldom are together on a picture, Jan hates it to pose, sigh!). We continued the stroll and then finally took something to drink. As we didn't had the courage to walk back home too, we took the tam and were home at about 17.00 o'clock.! Quit a day, hey? Today the weather still looks nice, but there is a change to come, somewhere during the day. Jan had plans for today too, but I am considering to stay at home, do a few little errands. So that was about our weekend, not bad at all. Time for the freebie, I suppose. It's part 4 of the Fantasy quickpages, hope you still like them. Oh, have to tell, also during this weekend I jumped a bit into PSE8 and I managed to make two little kits in it, yeah!!! Pfff, took lots of time, but finally I am learning a bit, still don;t know almost anything, but there is a little advance in it. Good for me, whoopeeee! Okay, I am finishing now, wishing you an aweful good day! Garden soil in a package!! Oh my, did we buy something funny yesterday in the shopping centre! There is a shop where you can buy all kinds of stuff, from housholditems, cleaning stuff, garden stuff, shampoo, DIY items etc.etc. and for a very low price. Of course the quality of it may be not the very best, but it saves a lot of money, so ideal for people who don;t have a lot to spend. So we went in and cam out with a few things, of course. The funniest thing and also practical was 2 packages of compressed garden soil! It weighs nothing, package is about 30x20 cms. but has the equivalent of 10 ltr of garden soil! Just put it in a bucket or so, add about 4 ltr of water to it and let it rest for about half an hour. AMAZING what you see after that time! Real good soil, bit looking like mulch, and feels good in your hand too! And it only costs 0,56 eurocent a package. Such a pity we only bought 2 packages, but perhaps one of these days we can go back to that shop(there must be one not too far away from our house too) and buy a lot of them. It is so practical! it doesn't take much room in your shed or garden, and if you need some soil e.g. for pots, you don;t have to deal with large plastic bags that weigh tons! Jan also liked to have a thermometer for the outside and there was one there too, for 2 euro, and with even solar light! I looked into the garden yesterday evening and yes, the things is really giving light in the dark, so that you can see the temperature at night too. Should try to make a picture of it when it shows it's little light LOL! I just phoned Heidi, to ask her how she was doing. We had made a vague plan for this week, that I would go over to visit her, but I called her several times, to see if she was home, and there was nobody home! This morning I was lucky, but it seems she was out a lot, and she told me, that the wound still isn'tclosed completely, but at least she has not much, or even no pain anymore. But now that she is without pain, she seems to overdo her activities a bit. Hmmm, advised her, to still take care and not do too much, because she had a severe blow with this operation and her body needs time to recover completely. I am happy though that she sounded better and is feeling better. Time now to finish this post, not before I give you your 3rd freebie of the Fantasy serie. Then I'll prepare myself to go out for a some grocerie shopping. Weather looks to be great again, about the same as yesterday, so I hope Jan and I will go out this afternoon. The exercise is good for me(as for Jan too). Walking keeps you fit, they say! Hope you will have some nice weather in your area too, if so, enjoy it to the full, you will never kow how long it will last. Have a great weekend! Yeah, as I predicted, it would be later that I could write my post. First we were up rather early, about 7.30, adn went top the lung nurse. As I already suspected, there wasn;t much new under the sun, the only good thing is that she prescribed me an apparel for the inhaler, kind of oval "box"where you shoot in the dosis of the inhaler and then breath in and out several times, so that the medication is really going into your lungs, where it should be. I just wonder why they didn't give it to me rioght away when they gave the inhaler. For the rest she hadn't much more to tell, she told me I am having underweight(I knew that too) and that it isn;t a too good thing when you have COPD. Okay, I am trying to eat better, I am actually, I have more appetite and so I hope slowly to gain a bit of weight again, best is to gain more muscle-mass. But in our family almost everybody was of a slim nature. Still I should try to get about 3 kilo more. Phooo, that is a tough job! She already talked about perhaps seeing a dietist, but I think I know what I need to do and can try it out first myself. If not really, really necessary I don;t want to run from one specialist to another! Next appointment with this nurse is on the 14th of July. After this consult, Jan and I went into the shopping mall near that hospital. I used to live in that area many years ago, and it was fun to see how the shopping mall changed. It was such nice weather, so we took advantaged of it. We even sat down in the open air to have a nice cappuccino, yummie. After the tour in the shpping centre we took the tram home and arrived there at about 14.00 o'clock. Enough talk about health issues adn so on! Talking about it too much makes you sometimes even feeling worse, LOL! Think it is best to give you your freebie mow, second part of the "Fantasy"serie of quickpages. Have a nice day, see you tomorrow again! Today I have a picture for you of my painting work, yes! And even two more. It was such nice weather yesterday, although a bit fresh wind, in our garden it was delicious to sit for a while. But I went out for a bit of shopping, didn;t find all I needed, so have to go for another trip today, bummers! Still, it gave me time to make a bigger walk and I passed the shop where I often buy some plants for the garden. This time I only bought some for Jan. Yes, as you know he has his "own little part of the garden" and as I have finished the painting it was time to put some plants on the spot beneath the windows. Now the garden looks much more "complete"Look here, first pic is of Jan's garden( he planted them himself!) and second is of the windows I painted yesterday. Aren't they of a overwhelming great looking colour???? I told you yesterday I installed the DAZ program on my computer?? Well, capricious as I am sometimes, I removed it already LOL! I thought I was being nuts to throw myself in another new program, not even getting along with my PSE8 very well till now. I should reserve more time for making tutorials in the Elements program and trying out things, to really get a bit of grasp on the program, but I just don;t seem to have the patience for it now. I already use it now and then, but really making something from scratch only in PSE8....forget it!!! Not yet. Oh, I am not really getting stressed by it, it will come as the time is right, I am sure. For the rest of the week they predicted some nice weather, towards the weekend it could be even around 20 degrees C(that is 68 Fahrenheit, yes I found a converter for it, LOL! ), so if the weathermen are right, this Whit Sunday weekend could be nice!!! Whoopee! Your freebie for today is the first of a serie of quickpages, I hope you will like. Serie is namend just simple "Fantasy". Now you all have a great day, oh, may be tomorrow I will be later with my posting, have to go to hospital early in the morning, not for something scary, but I have an appointment with a special trained lung nurse( couldn;t find another word for it) who will tell me eaxactly how to go on with my COPD, how to use the inhaler, etc.etc. Sometimes those sessions are helpful, sometimes I think it takes a lot of time for patients who really need her time more than I. But.... I am a good girl and go to this appointment and will listen to what she might have to tell. Don;t want to give my specialist the impressions I am not taking it serious enough. It's not in the hospital close to us, but at the other end of town, a ride with the tram of about half an hour. The only nice thing of it is, that is is close to a shopping centre, where I haven't been for years. May be even Jan will go with me to the hospital and afterwards, if the weather is okay, we can take a look in the centre and perhaps have a nice capuccino, yummmie!! So my posting could be in the afternoon! Better I tell you this before you start worrying where I am, LOL! I quickly explain the title of the post LOL! Yesterday I seemed to have a flow of energy running and I gace the wood on the bedroom, that is build and standing partly in the garden a good coat of paint, the special stuff for wood and outside conditions, the wood- stain. First we wanted it to be dark green this time, but the one green I still had, didn;t cover it well, so I decided to make it all lavender-blue(the colour I wanted the most, but Jan didn;t, hahahaha). So standing in a nice temperature, just a bitin the shade, while the sun was shining on other parts of the garden, I did the job( well, almost) and it looks much better now again. Just have to do one window, and if there is enough woodstaind left, perhaps the door of the shed and a little chair, but hadn;t the courage anymore yesterday, because in front of the window was standing stuff, that we still have to give a good place in the shed and or throw away with the next refusal-disposal picking up, and didn;t feel up to it to move that all around. But most of it is done and I was happy I finally did it. Again a little something done that was on the list of "some day it has to be done". you know what I mean?? It looks to be nice weather today too, so I better go out while it still is nice, must do some shopping, hope I will be back soon, still want and have to do some errands in the house too. I did look into DAZ a little bit yesterday, it isn't a program easily to learn, but if you take it step by step(found a good starter tutorial) I think it will not take too long before some reult will show(at least, I hope so!!) I am a girl, that always wants too fast a good result, the impatient part of me, although I know some things take time and take practise, practise, making mistakes, practise again etc. We'll see how far I will come in a few weeks, or months, LOL. Freebie for today is a rather small one, but I hope you will like it anyway. It are 2 quickpages, called it"Magical Waterfall". Have fun with it and also have a wonderful day! More new things to learn! It was a rather nice weekend we passed. On Saturday we did go out for a while to the fair, but it wasn't as extended as we thought and during the walk the weather becamse even a bit chilly, so we didn;t spend a lot of time there. Most exciting news of that outing: Jan bought himself a bundle of socks, LOL!!! But the weekend was nice in terms of designing. I finished a serie of quickpages again, amd I am happy about them. We'll start with them later this week. At the moment Jan is in hospital for a test again, you could say the yearly check-up. As you know I have PSE8 on my computer, but the learning of it is on a very low speed, hahaha! I am using it now, for making (partly) the quickpages, and by doing so, I already learn a bit how to handle some features in it. But it will take lots more time to really get the grasp of it! (I am just not taking enough time to do all kind of tutorials, I am not patient enough!!). And if that is not enough I downloaded a free program, the Daz Studio! I am using so much figures now in the cards for The Starchildren Project blog and also for the quickpages that I thought it might be nice to make them myself. Oh my, what an ambition! Have to learn to deal with that program too! I have NO idea when I will be able to present you my first humble try, LOL! But as you see, I am not sticking to the usual stuff. And we also got some news from Snowy that she is really busy with the website for the forum shop part. So may be soon I will be able to tell you it is opened again! We should give Snowy some time for it, it's a big job, but I am sure the result will be great! It's not the only thing she has to take care off, lots going on with her and she has also her job to go to, so be patient, it will be rewarded! Now the freebie I have for you. Also quickpages, yeah sorry, I like making them in the moment. I found a great freebie on http://craftyscraps.blogspot.com and used some of it for this freebie. It's named Funny Faces and I hope you can do some nice things with these pages. Off I am now, to start with a special project, and I hope to have some time today to start with Daz. Oh whee, exciting! Have a great day, till tomorrow! It was good to see the sun was working when I woke up LOL! I know, the sun is there, but sometimes it's hard to believe it when the days are grey and real cloudy. But today it looks to be a bit different. Although temperature is way to low for this time of year, there is hope it will slowly go up the next few days. Anyway, I am taking profit of it I think, first do a few grocerie shoppings, and better do it when it still looks nice and may be it will even stay nice so that I can do a little work in the garden. Now is the time to keep track of the progress of growing from some of the plants. Some of my Clematis already have a few buds, my Climbing rose also starts to have buds, and I always find it kind of exciting to see the first bloom of it. This week I also bought a little Oleander bush, only about 30 cms. high, but I must put it in a bigger pot. I already have an Oleander, but I don;t know what is wrong with it, it doesn't look good, perhaps I didn;t cut it back well enough last autumn. That's why I decided to buy a new one. We had a quiet day yesterday, and enjoyed listening to some tapes with all kind of favourite songs. I really love that you know. I am at the computer, singing along with the songs, Jan is in his chair, reading a magazine or a newspaper, it's coz\y that way.! I spent some time re-organizing all my resource files, slowly all things were cluttered up a bit, still have to do some work on it, but it already looks much better and I can find the things I need quicker now! I also made two new cards for the Starchildren blog, I can show them to you, I think Minky will post them a bit later on the blog. I like making those cards, I can put all my imagination in it, LOL. Also finished a little "kit"of 4 quickpages, I will post them next week. For today I have another one with 5 quickpages, and I think at least one of my readers will be happy, because it are rather funny pages, all made with COWS! Therefore I named the set "No Milk Today"! I very much like the two that are on the bottom of the preview, what do you think of the meditating cow????? Okidoki, I hope you have a few nice pictures that will go well into these QP's ! I will take my second cup of coffee now and then will go do my things. You have a lovely weekend, with a lot of scrpping inspiration!! We had terrible news on tv yesterday! There was a plain accident in Tripoli, Libia, it crashed just before the landing and there are about 90 persons dead, among them about 61 Dutchmen. So all passengers and crew are dead, only one child survived the crash, till now. They have no idea what caused the accident, may be it will still take a few days before it will be reveiled, if it will be truly reveiled. Of course our sympathy goes out to all family and friends of the deceased. In a few weeks, on the 9th of June, we have elections for a new gouvernment, so you can imagine all the parties are running election campaignes. As we have about 12 different parties to choose from for the House of Representatives it isn't always easy for us to choose one. Normally we always have a gouvernment based on a coalition, but the memebers can be of importance. But they stopped their campaigns now for a day or two, because of this aweful accident. Well, you can imagine that in all the newsprogrammes they are talking about the crash, sometimes just telling over and over the same thing, because new facts just will come out very slowly, especially because it happened in Libia. And although it is a shock to everybody and a sad thing that happened,I wished they only came with a news item when there really is new news! What good is doing all the speculating what might have happened? Okay, that was about the most important thing that happened yesterday. I really don;t have much more to tell you, just did some errands, that's all. But I have a funny picture to share with you. I made it when we were visiting several faires. And look what people do here, when there isn't a place to park your bike! Click for a bigger view. Isn;t it a funny picture? And now on to the freebie. It;'s a kit, named "A Noble Friend". You all have a great day.! Why isn't the wind changing? Looks not too nice this morning, it's rainy, bit grey, and some wind. Not really a nice weather for May. But to have a change for the better, sunny and warmer weather the wind needs to change direction. It still is coming from the north, and if we want good weather it should come from the south, or south-east. It's a real pitty it isn;t a bit better, all was so nice at the end of April. Let's see if towards afternoon it will improvea bit. Still must go out and I better like it under dry conditions, LOL. Don't have so much to tell you. It was a normal day yesterday, nothing special done, although in the evening I managed to finish up some quickpages and a new card for The Starchildren project blog. I think it will be posted soon. That's about all IO can ramble about for the moment. Not a very insteresting post, hopefully tomorrow it will be better. I do have a little kit for you, named "Happy Place". It is a very simple one, but may be can be useful for something, I don't know. Now I must go move around a bit, first get dressed and some little tasks are waiting, hahaha. Yesterday I got a phonecall of Heidi, just to talk a bit, mostly about the pictures I also sent her, from the garden. I knew I would receive a comment on that, LOL! Of course I asked how she was doing. She is trying now to go through the day without any painkillers, but it is still hard, she says. Especially when she goes to sleep, so I advised her to at least take one when she goes to bed, so that she will be able to sleep. The wound is closing itself slowly, although not yet completely, which also would be good, because there still is a lot of "carbage"in it. She has to clean it just with water, under the shower, and she has a special salve for it too. Well, at least it is going slightly better, it just takes a lot of time. It was nice weather yesterday, so we could sit for a moment in the sun. I think we should profit of every moment. But I also did a few"boaring"tasks in the house, and then I even could finish a kit yesterday. I must say I am more into quickpage making for now. So I will stick to that mostly for a while, but in between also still will make a kit. I like the quickpages because you can really flow on your imagination. And they sometimes ask more time then a kit! Anyway, the freebie for today is a serie of 4 quickpages, named it"Imagine a Special Place". Have some fun with it and also have a fantastic day! Some pictures, yeah, I made them! I hope every mom had a wonderful mothers day yesterday! I am not really a mom, but still I feel like one, from my cats, LOL! and a little bit of my friend Heidi, and mom or not I also had a lovely day.! The weekend started a bit early with me this time, already one Friday, wheee! Yeah, we have the new cupboard standing in our room. It arrived rather early Friday morning, so Jan started right away placing all the stuff from the stereo in it. In the mean time I was out doing a little shopping and coming home most of it was already done by him. Then I helped him a bit arranging all the other stuff in it and filling up the column fo the cd's! Gosh, we should find another one, this one isn't enough!! You can see them bigger by clicking if you want. It looks all so much more "arranged" not cluttered anymore, whoopee! And here a more detailed one from the flowers, aren't the adorable??? And even though it wasn't a really shiny day yesterday, it still was nice enough to do something in the garden, so I was busy there for a while, replanting some plants, getting rid of a bit of weeds etc. And it felt good! She keeps amazing me, it's a real special lady, and this blog can really help you if you are in a bad period of your life, or just having a bad day, and just having a look and a little reading cannot hurt you! Okay, almost at the end now! Just reminding you of the daily downloads on our forum, if you should forget! It's a real lovely kit, when you have all the days together! And now I have also a freebie for you. It may be a strange kind of kit, but could also be helpful. I made you 26 pages, each page for a letter of the Alphabet, so you can make your own Alphabet book. It could be about each letter representing an important even in your life, or names of people that are important fto you, or an alphabet book for your child. I think you can do a lot with it. I have to thank http://scrapkado.blogspot.com/ for the alpa I used! Also made you a few frames, to give you a start. Also have a fantabulous day! I had to make 3 previews, it just didn't all fit into one, but it's just one download! Had the phonecall from the doctor yesterday. Apparently I haveastmatic bronchitis, or better said COPD in earlier stage, so at times I have some difficulty breathing, it seems the out-breathing isn't too good anymore, so that also infects the in-breathing. It's not something to laugh about, I will have to take it seriously, which I do. Will have to take the medication I already have( the puffer ) and must be a bit careful I suppose with not too good weather, I seem to have a bit greater risk on infections on the breathing parts of the body. Well, now I understand better why sometimes I am feeling more tired than other times. It's part of it. Okay, life still can go on, although have to make probably a few adoptions. But we can live with that. Doctor also gave me results of the cardiologic test I had when I felt so bad. But till now, nothing is wrong with the heart. So hearing that, I started laughing a bit, from relief, and the doctor seemed to get angry a bit at me, because I should not consider my "disease"as something to be light hearted about. Oh my God, didn;t he understand why I was still joyful at that point???? I had fear there might be also something wrong with my heart(as it is the thing my father and other members of his family died of) and there isn;t, at least not now! Later I said to Jan: "Although the news from the lungs isn;t the best I could have had, am I not entitled to be happy also, because at least my heart seems to be in order???" I think so!!! Always look at a bright side of things, and I think that is a positive thing out of a not so good thing. Well, all together, I have to change a few things in way of living, or doing things, not too much yet, so I am planning to walk around still for a good number of years, we hope. At the moment we are waiting for the delivery of the little cupboard for our stereo. It should be somewhere in the morning, but that can be stretched out from 9.00 till about 12.00 o'clock. We'll see when they come. When it will be brought I will help Jan first to get it on it's place and then probably try to disappear for a little while outside, because then he has the quiet and peace to get all the stereo in it's place and connect all that has to be connected, hahahaha! And the freebie is a fantasy inspired one, a collection of 4 quickpages and 4 backpapers, I named it "Seasons in Fairyland". Enjoy them and have an awesome weekend! I planned to do a few things in the afternoon then. First a tour with the vacuum cleaner(again), and if the weather stays as it is at the moment, may be I'll go to the low-cost supermarket to buy food for the cats and some other things that are really worth buying there. Then Jan also wants to disconnect all the stereo and clear the place where the new cupboard has to be. If he does that kind of thing I like to be far away from it, hahaha. May be there is a little time to do something in the garden, have to keep that up too. Okay, in big lines that are the plans, we'll see tomorrow what actually was done. Today I have a small kit for you, I wanted to make something in somewhat not so bright colour and came up with a blue and a grey colourscheme and suddenly it reminded me of a bit of rain, and finally named it"Just after Rain". And here the little kit for you. Enjoy your day, even when sometimes it isn't going all too smoothly, we have to get something positive out of it. There should always be a moment of not too bad! Let's hang on to that! Today we have the 5th of May, which is always a special day for the Dutch. Then we celebrate we were liberated from the German occupation. And I believe, that although it happened already a long time ago, it never should be forgotten, this WW 2. There happened terrible things, not only by the Germans, let us not forget that either!! !, that even now people try to deny and that can never be tolerated. So yesterday everywhere in the country there were memorials for all the victims of WW 2, but also for the victims of all the wars that followed the "big"one and that is also a good thing. And today is "liberation"day as we call it. So a lot of people have a day off from work and go to the fair or just stay at home, whatever. May be we go out for a bit this afternoon, I hope there will be a bit more sunshine then. Yesterday we were lucky! Why? Well, we were looking a long time already for a not to bigpiece of furniture to put our stereo in and the stuff you haave for it, like headphones and tapes etc. It also had to fit if possible the style of the other furniture and yesterday we found it in the second hand store we often go to to look around! It's a case of being patient sometimes, for weeks they have nothing at your liking and suddenly you find it all, because we also found a huge kind of pilare to put all the cd's in! I think the thing is about 2 mtr. high and the width of a cd box. Wow, and for a VERY nice price. They will bring the stuff Friday morning. So with a bit of luck next week I will have a picture from it. Another thing we can strike through on our wish-list, hahaha! Next thing will still be a carpet for the sitting room, but I am sure we will find that too and just in the right colour etc. But that we will buy all new, LOL. And what's in store for you today? I made a "kit", well, it's containing only papers, 12 to be precise, of the Zodiac signs. Part of the figures I used for them come from http://umrae-thara.deviantart.com/, take a look there, she offers some nice things all free!! May be you can do some nice things with these papers. Now have a great day, be creative and if you made something nice, why not show it to me and the readers here???? Cats can bother you LOL! It sometimes is hard to start posting! And why? Because first Dikkie Dik is coming of the couch, where I already did give him a bit of attention, but he wants more, he prefers to jump on my knees, but hey...... I can do without that for the moment! So after a few moments of again caressing him he walkes away, very disappointed. So pfffff, I can start finally! No, wrong thought! Now Brodski is coming over again, he wants his portion of attention( which he had already when I woke up), so being a nice person, LOL, I bend over and caress him a bit, telling him, I have to do some things, so we will meet later, hahahaha. And only then I am able to post in peace and quiet.! a very nice calendar page for the month of May. I'll give you a preview, for a bigger version you'll have to go to the blog, and download it there. Then I can show you a mini mini kit I made for http://thestarchildrenproject.blogspot.com/, it isn;t yet on the blog but I am sure Minky will post it soon. So if you like it and want to download, take a look, or come back there a bit later.Oh it's posted now, but on the starchildren blog go to second page(on bottom once to older posts) and you'll see if you scroll a bit, a header with "Kyra's Kits". Or look in the sidebar for the link too! Wow, I have another place of my own there, thanks Minky! What else is there to tell? Not too much. It was a very nasty day yesterday, concerning the weather. Lots of rain and wind, grey and gloomy, so we stayed in. It looks a bit better today, good for me as I have to do a bit of shopping, not much but a few things are running short in the fridge. I can tell you not too much about Heidi too. I phoned her in the weekend and she is still in a lot of pain and has to take painkillers for it, to make it a bit bearable. I guess this will be a long process for her, the poor thing, it's not a question of days but weeks or even months! But as long as there is progress in the healing process without any complications, she still will be kind of happy. Okay, on to the freebie part and such. First the daily download of http://www.magickalscraps.com/bb/index.php, here the preview, downloadlink on the forum again! This one is from the newest team member Suruha, who also made the colour scheme and theme! And finally here is your freebie for today. Not a very big one again, but is was rather a time consuming one to make LOL. I named it "A Dream of a Window View". Hope you can do something with it. It was fun to make it. Oh yeah, I also made us a big pan of soup, it tasted yummie, still have some stuck away in the freezer. walk and were glad to return home and be in a nicer temperature. I thought it might be fun to do and it keeps your imagination working. Now your freebie for today is a small kit, named it "Simple Spring", hope you can do something with it. And don;t forget the daily download on the forum http://www.magickalscraps.com/bb/index.php.